From where I got the entire Narayaneeyam text typed in Sanskrit and English. I did inform her and she said it was ffine. 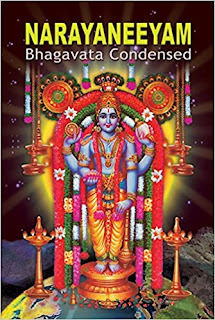 Narayaneeyam is a Sanskrit Summary of Maha Bhagawatham written by Meppathur Narayana BHattathiri. He wrote it in front of Lord Guruvayurappan to get cured of his paralysis .Though it was very famous in Kerala among Malayalam speaking people , very few people knew about it outside Kerala. 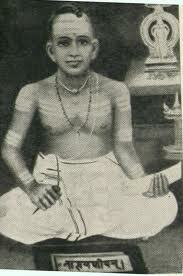 The great Savant Sengalipuram Anantha Rama Deekshiithar , who himself got cured of Arthritis by reading Naayaneeyam popularised it in Tamil Nadu . The seed that he planted have now become a tree. 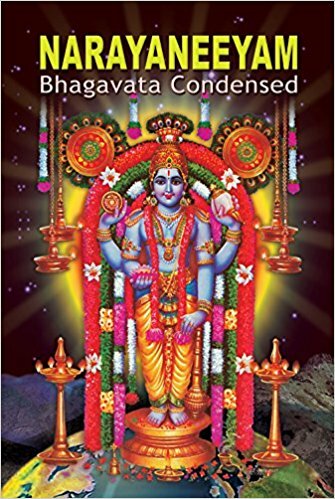 There are no localities of any town in Kerala and Tamil nadu or villages , where there are regular classes being held to teach recitation of this great book .These are mainly conducted by ladies for ladies in their spare time. (Today I completed rewriting my translation of Narayaneeyam , with Sanskrit and english text and audio of each dasakam. I am giving below the effect of hearing /reading different Daskams(Chapters) as mentioned in the Narayaneeyam book published by Giri Traders .Share it with your friends (please) .When a person needs it , copy the concerned and send it to him by Whatsapp . Dasakam 100 Description of God from head to foot. On which there is a white vertical sandal paste. 100.2. Oh Lord , let your eyes ,which cools the entire world by its merciful looks. Who will narrate the greatness of Lord Vishnu? Who is there to count the atoms of the entire earth? With which Vishnu’s feet this earth was measured and was filled with wealth? Which Maha Vishnu wears all the earth? Dasakam 67 Destroying of pride of the Gopis.